Essentially, HAMMOND BOND is a re-release of the 1966 album FROM TWEN WITH LOVE by German organist Ingfried Hoffmann, who was a member of Klaus Doldinger's band in the '60s. 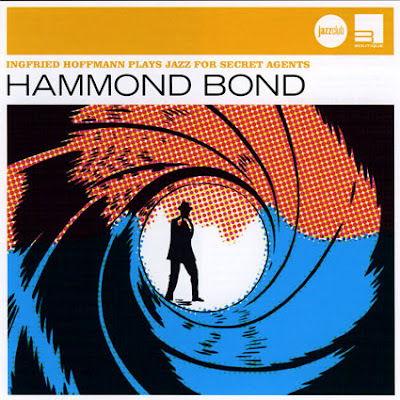 The new title (which is given the tagline "Ingfried Hoffmann plays jazz for secret agents" on the CD cover) emphasizes the fact that the original album was released to benefit from the first James Bond craze, but it makes the album appear to be more of a novelty record than it really is: FROM TWEN WITH LOVE (the original title references the second James Bond movie, of course, and the Philips Twen label where it was first published) is an organ jazz album very much in the vein of the soul-jazz recordings popular during this time, and apart from the inclusion of covers of the three Bond title songs that existed back then -- "Thunderball," "Goldfinger," and "From Russia with Love" -- and the fact that several tracks reference the superspy in their titles ("Yeah, Dr. No," "007 Bond Street"), the album isn't as gimmick-driven as its reissue title implies. Granted, several tracks have a strong beat influence and aren't too far away from what Riz Ortolani, Piero Piccioni, and other Italian musicians were composing for dozens of European crime movies (and, yes, Bond rip-offs) -- "Phantom's Walk" would easily fit on a compilation from the BEAT AT CINECITTA or EASY TEMPO series -- but Hoffmann's bright, slightly psychedelic organ and Volker Kriegel's guitar get a lot of space for a number of inspired solos. Most of the tracks are originals by Hoffmann, and he has a knack for writing good hooks (he would later score movies himself), and more often than not, you could imagine Lou Donaldson dropping by to add some saxophone to the music. The Bond covers are fun, and it's interesting to hear those bombastic arrangements played this breezily. Unfortunately, the reissue messes up the original sequencing of the album, and it adds four tracks from different sessions: three from Hoffmann's 1963 album HAMMOND TALES (recorded with a different group which includes drummer Klaus Weiss), and one from Peter Thomas' 1966 soundtrack PLAYGIRL. Still, the new track order works well, and the fact that the added tracks have little to do with the original album concept doesn't detract from the fun. HAMMOND BOND isn't groundbreaking or essential in any regard, but it's a solid organ jazz album that's enjoyable even after the novelty factor has long worn off. This review was written for the All-Music Guide on February 7, 2008.